One of the major reforms being pushed in opening up the selection of the next UN Secretary General is a joint letter from the Presidents of the General Assembly and the Security Council on how the process would unfold. In the 1996 andd 2006 elections, the Council was more transparent in sharing updates as it considered potential nominees, but in neither year did the process include a formal engagement between the top officers informing other member states on the process. 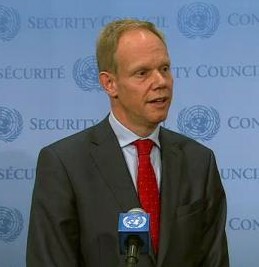 Such a reform was strongly encouraged this year by civil society groups such as 1for7billion and several UN members. It was one of several reforms which survived debate and was included in a resolution adopted by the Geneal Assembly last month. This week, the Security Council held discussions on the body’s “working methods,” including how it would go about nominating the next Secretary General. There was continued support for the nomination of qualified female candidates and providing sufficient time for non-Security Council members to hear candidates’ visions for the organization. 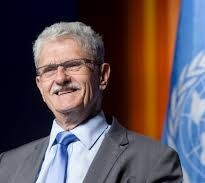 Inner City Press noted that UNGA President Mogens Lykketoft says that he has been discussing the release of a joint letter with the Council president. The question is when should such a letter be distributed, officially opening the contest? And what should such a letter say? Below is a draft of such a letter as it might emerge. A key assumption being made in this imagined text is that the letter would be circulated next month, during the United Kingdom’s Council’s president. The UK has been a vocal proponent of a more transparent process, advocating three principles to which it was committed as part of next year’s selection — equality in gender consideration, predictability in the timeline, and transparency through involvement of all UN member states as well as civil society. It is quite likely that if a joint letter is to be released, it would occur in November. However, rumors are that Russia is encouraging a postponement of the letter’s release until early next year. The same suggestion was raised in a discussion by Global Memo with an official with the Slovene mission. Former Slovene President Danielo Turk is a rumored candidate for the post, and an official with the mission has confirmed that he won’t officially announce until the process is defined in a joint letter or otherwise. The same official has raised the suggestion that the newly elected members of the Council — Egypt, Japan, Senegal, Ukraine, and Uruguay — might prefer that any joint letter from the President of the Council detailing an election in which they will take part be held until they assume their seats in January. During the October 20th working methods session of the Securty Council, however, Eygpt urged the “expeditious commencement” of the process and release of the joint letter (video, 1:22:50 mark). A top NGO official working on reform to the process however has suggested a postponement to next year would kill the momentum for a joint letter and other transparency reforms. This draft text posits how PGA Lykketoft and UK Ambassador Matthew Rycroft would describe the interest in a transparent process during the past year and what procedures might have been agreed to during this week’s “working methods” session in the Council. They invite UN members to put forward candidates meeting certain criteria and to do so by a set deadline. Should such aspects be adopted as part of the process, the selection will be far more open, transparent and inclusive than it has been in the organization’s 70-year history. It reflects a more conservative approach in echoing the Assembly resolution while leaving out the more far-reaching proposals advocates have put forward. Share your thoughts on this sample text in the comments below or with us on Twitter.